I’m staying in the EuropÃ¤ische Akademie Berlin, in the middle of the grand villas of Grunewald in western Berlin. An additional advantage is the huge forest to the south west of here, towards Wannsee. I’ve just returned from a 40 minute run through the forest and around the Grunewaldsee, the early morning sun shining through the trees and fog rising from the water. There’s nowhere even close to equivalent in London, and it has been the perfect way to clear my head for the day ahead. Friday’s run was not so scenic – cloudy and damp rather than sunny. 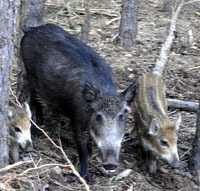 But I saw Wild Boar (Wildschwein) for the first time in the wild in Europe, happily pottering along beside the path on the western side of the Grunewaldsee. I thought they tended to avoid humans? London-Sheffield for an early meeting: how hard can it be?